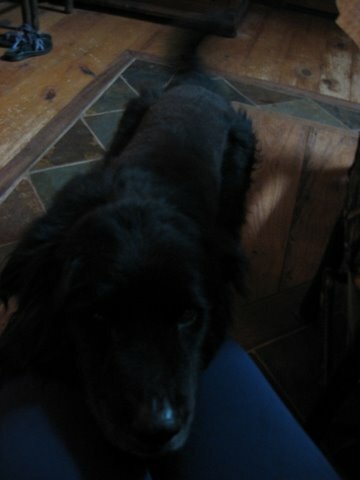 It's hard to take pictures of a black dog. This is Copeland, the sweetest dog that ever was. As you can see, his interests involve putting his head on your lap for pats, and wagging his tail. His other hobbies include smelling and trotting. In the evening he likes to kick back with a good bone. For several years he’s been struggling with Addison’s Disease, an adrenal disease that explains his somewhat neurotic and sluggish behavior as an adolescent. Two years ago it was diagnosed, and it’s been under control. His medicine does include the side effect of diminished hair growth, which combined with his annual summer haircut explains (or at least partly explains!) his inverse mohawk. He’s been working hard to grow it back. Really his weird hair just makes him more charming. Copeland is a good boy and stays near the house, so he gets to go out by himself. When he’s done with his sniffing and trotting, he’ll come peer in the window to the living room, which has a pretty good view of most of the house. He’ll stand there, his furry black head silhouetted, until someone waves at him. Then he’ll trot down the hill around to the front door. Through the other windows, just his tail is visible, curled over his back and wagging as he comes to meet you at the door, as previously arranged. The only thing he ever asks from you is a belly rub as you walk by. He rolls over and thumps his tail. Please? The only time he ever talks is when it’s time for a walk. Then he leaps and yelps like he’s being killed while I put his leash on his buddy. He still gets to roam free and sniff as always, but as a team he thinks it’s just the best. It’s hard when pets die, I hear, because they are so innocent and perfect. So when Copeland wouldn’t wag his tail last week, and when he went to the vet, and died there overnight, my feelings were not complex. This animal who’s brought so much joy to my life just by being around… it’s impossible for him not to be around. It’s impossible for him to have died alone on a concrete floor. it’s impossible for my parents to have brought him home in a black trash bag, and for us to bury him that day with his bed. It’s impossible that the jingles I hear aren’t his collar and the black shadows I see aren’t him coming up for a greeting. It’s impossible that our other dog doesn’t have anyone to help her beg, anyone to bump up against when she’s just too excited to walk straight; impossible that already she’s stopped waiting for him at meal times. It would be easy to just think of him as not home if I had not patted his head and shoulder and rump through that bag after we lowered him into the ground. The ability to imagine him down the hill, near the big rock, curled up under the soil helps me remember that he’s somewhere else now, and that is an ability I dread and treasure. I told him he was a good boy, and threw dirt on his grave. He was a good boy, through and through. What better can you say about a dog?